For the conventional filtration through a filter bed, granular materials such as sand and anthracite are used. 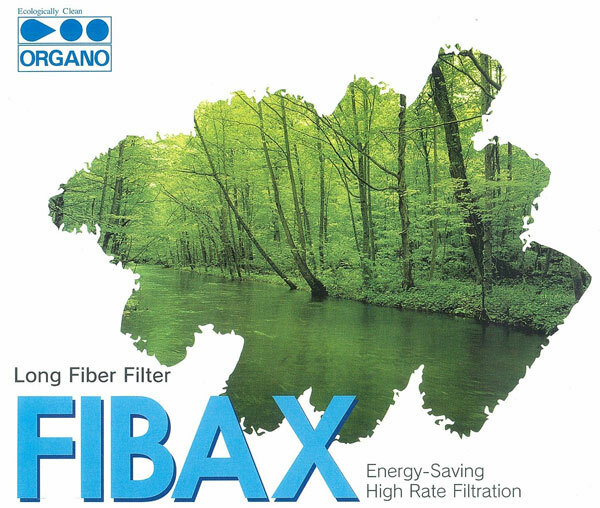 The FIBAX high rate filter makes use of bundles of long fibers which permit filtering at flow rate 3 to 10 times as high as those through the conventional sand filter. The use of these long fibers also has an advantage of arresting a large quantity of suspended solids even at exceedingly high flow rates. When backwashed, the long fibers completely release the suspended solids accumulated thereon, thereby effecting a thorough backwash. The FIBAX high rate filter can be operated either by gravity-feed or pressure-feed depending upon the installation place and/or applications. Filtration at exceptionally high flow rates. Short backwash duration and therefore small quantities of backwash water(filtrate water). As the pressure drop through the FIBAX filter is minimal, a highter level of feed water is not required. Unlike the conventional filters, the FIBAX filter does not require any free board for backwash and therefore lower effective filter heights will do. Long fiber materials do not release any leachables, and are resistant to acids and alkalis. Hence, the FIBAX filter can be applied not only to water but other liquids. When used for the in-line coagulation and filtration, the FIBAX fiter requires a minimum of coagulant e.g. PAC. Therefore, the treatment is backwash waste water can be effected with ease.